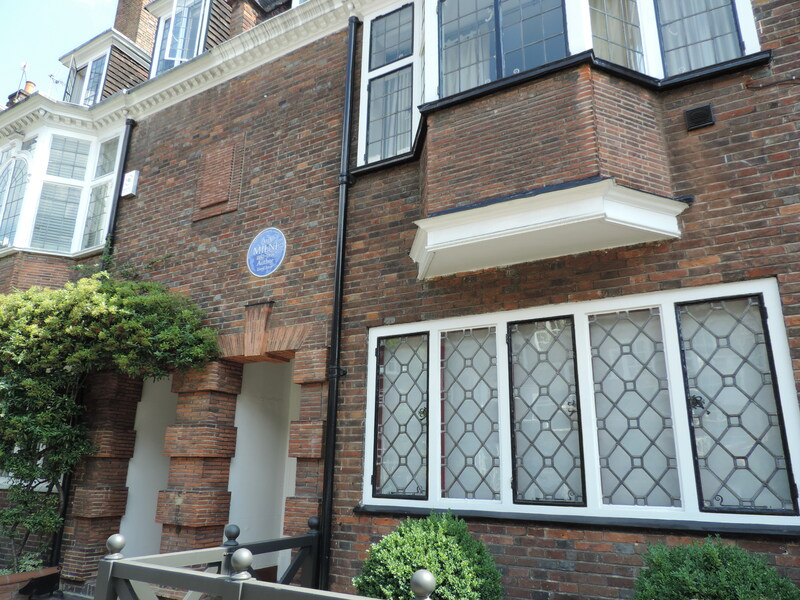 We toured London’s Chelsea neighborhood in summer 2013 on a quest to find blue plaques marking the homes of literary figures ranging from Mark Twain to Bram Stoker. However, we missed a very prominent literary figure, something we did not realize until we returned to Chelsea two weeks ago (summer 2014) to visit the home of famed writer Thomas Carlyle (more on that in a later post). The literary giant we failed to catch is A.A. Milne, author of Winnie the Pooh! 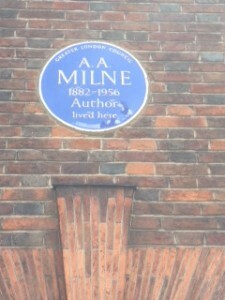 The English Heritage plaque and website only lists Milne’s birth and death dates, not the dates he lived in the house, so we can’t say if the real Christopher Robin (Milne’s son) grew up in this house. I dare not post an image of Pooh or any related characters for fear of a cease and desist order from the Walt Disney Corporation, so we’ll just have to make due with house pictures. Chelsea’s main street separates the Milne house (13 Mallord Street) from the homes of the other writers we wrote about in a previous post. Milne’s street has its own charms, such as the gates between the houses, which I can imagine might have once been used for carriages. 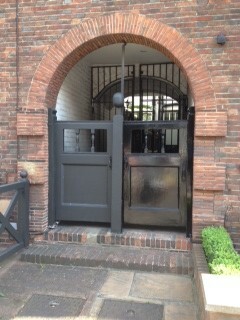 After the Milne house, we walked north to Kensington to pick up the plaque at director Alfred Hitchcock’s house. (A friend asked if we looked in Hictchcock’s “rear window,” the answer to which is “no”). We saw even more charming homes and streets along the way. 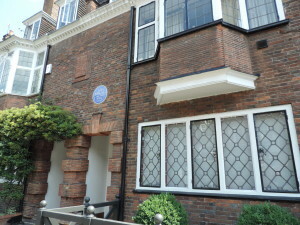 Try a blue plaque pursuit for yourself, it is a great way to see London neighborhoods. I am so enjoying your travels in London. Having gone to college there in the early 1970s, I used to wander everywhere. Hitchcock’s former home was not very far from where I lived, so I am very familiar with that area. I am anxious to get back to London. It’s the easiest big city in the world to get around in (IMHO), and there are wonderful, historic sights at just about every turn. Thanks Melissa. I really love London. I agree that it is very easy to get around, and there are so many things to see.